Dirtydog 4X4 Netting is an easy on and off durable heavy weight polypropylene webbing that is designed to keep items from flying out while still allowing an open air ride. Constructed of 1.5 " heavy weight webbing with Re-enforced stitching and black anodized grommets. No special tools required for installation. The craftsmanship of their products is remarkable. The fit and finish are high tolerance. Unfortunately, maybe a bit too much so for the manufacturing of the accompanying doors. Installation is very difficult and somewhat confusing. The netting is strong and versatile. I have attached molle bag to the webbing for custom storage. It appears fade resistant and cleans easily of sand and other debris. One negative is the excess tag end of the faster. It would be nice to have a supplied clip to keep the flapping to a minimum, keeping things nice and tidy. Overall, this is a great accompanying product on a lackluster primary product. I would recommend Dirty-Dog and their products. 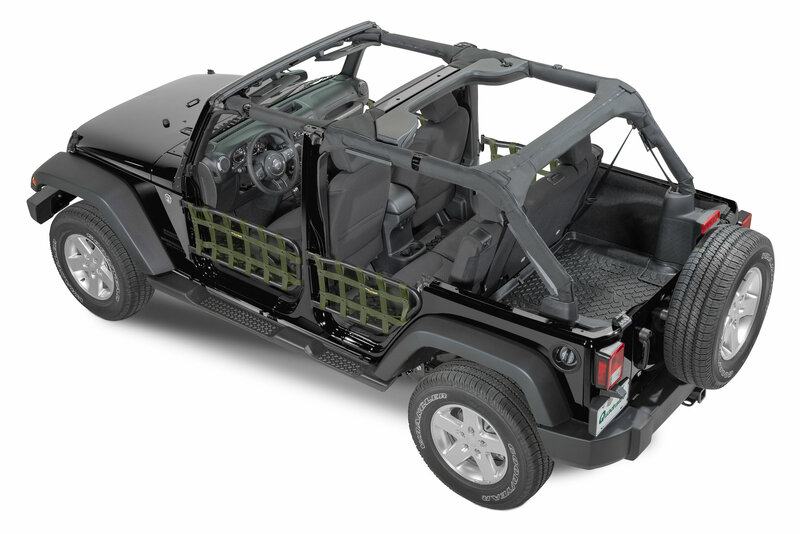 I have the front cargo net and tube door nets. I have the full Smitybilt C-RES nets for the rear. Dirty Dog is 'slightly' better. Straps are thinner, however. What specific doors does this netting fit on? Do you carry them?